A.E. Clark received her B.A. 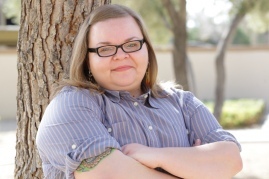 from Beloit College and her M.F.A in Creative Writing from the University of Nevada, Las Vegas. Her work has appeared in various journals, and her chapbook, Addresses Home, was released in 2015 (Finishing Line Press). She currently lives in Las Vegas, where she works as an antiquarian bookseller.